If I had to name one trend I’ve been obsessing over lately, it’d be Pineapple print. I don’t know what the deal is but I have been in LOVE with it lately! Summer is one of my favorite times of year and fruit print just has a way of making me feel like a little kid again. I had been searching the past few weeks for pineapple printed top and really wasn’t having a lot of success. Everything was either too childish looking (see my point? ), or it was really expensive. I found this top online at Forever 21 in the Men’s section oddly enough. I LOVED that the print is BOLD and makes this shirt very much a statement piece. I purchased this tee online here for only $12.00!! It's sold out now unforunately!! I've listed some other sweet pineapple printed items below so be sure to check out those. When this pineapple tee arrived, I cut and removed the elastic-type collar from the tee (I thought it made the shirt look manly) to create a new, more feminine neckline. This shirt is exactly the reason why you shouldn’t rule out the men’s section when you’re going shopping. You never know what you’ll find!! All it takes is a little creativity and imagination and you can create and make anything you want. Love that top! Such a fun look for spring! LOVE the pineapple top! Super cute!! I love shopping the men's section for things :) love the tee! 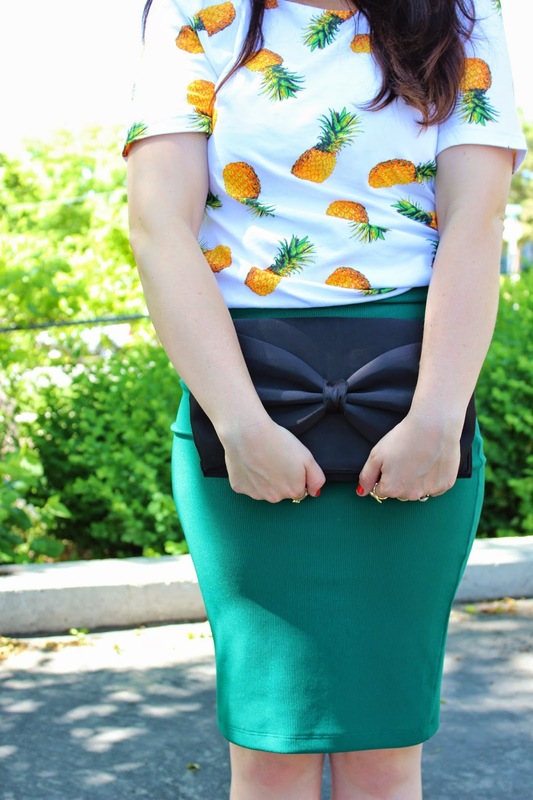 I am loving the pineapple print right now! This is so cute! That top is spot on for the pineapple love that's been everywhere! I will have to get the top for my friend, as she collects all things pineapple. Love the yellow and the citrus fruit! I also love it with the green skirt! what a fun top and love that bag! I actually saw that top in the men's section and thought about it... but I had just spent a whole lot! It looks great! Love the combination.. you look lovely. I love this shirt!!! It looks so cute on you!